Meet Legolas. He looks gorgeous and bright eyed but this was not the case when he arrived into my hedgehog rescue. Sadly, I am seeing an increasing number of hedgehogs coming into rescue with foot and leg injuries. If only hedgehogs could talk and then I would know for sure what had caused them. I do know that they face many dangers out there in the wild. They can get attacked by foxes or dogs. They can get their feet trapped in things including the log edging that is popular for use around borders. Road traffic accidents can cause broken legs and also getting caught in rat traps. Legolas arrived with both feet badly swollen and infected. He also had a large wound on his left hand side. He smelt strongly of infection. On arrival, I washed his wounds with antibacterial agent (Hibiscrub) mixed with saline solution. Legolas was then treated over many weeks with antibiotics, pain relief (with added anti-infammatory ingredient) and daily topical would treatments. It took months but you will see above that his feet eventually started to fully heal. He lost a few nails during the treatment but most eventually regrew. On release, he was only missing one nail – where the nail bed had been destroyed. Legolas was lucky and he managed to keep his legs. Others are not so lucky. This is Rupert. He arrived with half a rear leg missing and just a stump left behind. He could not be left like this. The stump would drag on the ground and keep opening up the wound. He would be at risk of constant pain and infection. The only option for Rupert was amputation of the remainder of the stump. I have also recently admitted this hedgehog with a swollen front leg. Unfortunately hedgehogs cannot survive with an amputated front leg. It is also virtually impossible for a vet to pin these kind of leg breaks due to the way the hedgehog curls and particularly if the fracture is not fresh. The first thing required for any hedgehog with a swollen limb like this is an x-ray. It is vital to know whether the leg is broken and infected or just infected. Luckily for this hedgehog, there is no break. I am treating him with pain relief and anti-inflammatory drugs, along with an antibiotic that is good for wounds. Hedgehog with swollen and infected front leg and foot – around 4 times normal size. He has been x-rayed to make sure it is not broken. It is hard to prevent these injuries but you can do your bit by keeping your dog under control in areas where there are hedgehogs and not letting them out at night. Take a close look at your garden and check for potential hazards, such as gaps between log roll edging or holes that a hedgehog could fall into and get injured. If you do spot a limping hedgehog, seek urgent help. Fresh injuries are easier to treat before they become infected. Not all leg problems mean the legs are broken or infected. Neurological damage (e.g. from being hit by a car) can also cause a hedgehog to drag their rear legs, as can some internal parasites. Like humans, hedgehogs can also tear and strain ligaments. Whatever the cause, it is vital to get the hedgehog to a specialist rescue straight away. Leg injuries are also amongst the most expensive things for a hedgehog rescue to treat. They require many weeks of drugs and wound treatment. If the infection has got deep into the bone, special antibiotics for osteomyelitis (bone infection) will be needed but it is not always possible to save the leg. I have also had some success combining antibiotics for osteomyelitis with Arnica pills. Amputations also have to be paid for, along with antibiotics to prevent infection. You can find out more about my work here and can also support my work here. 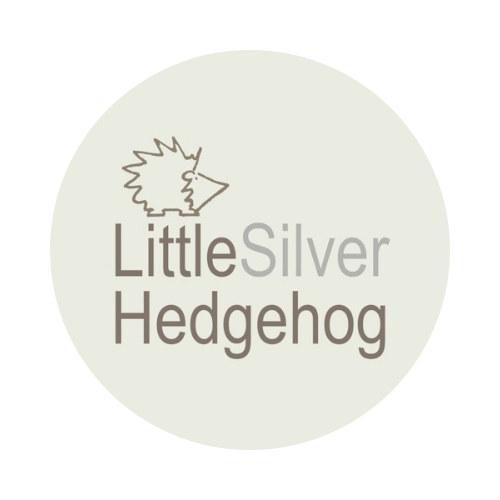 I also make handmade silver jewellery inspired by nature and wildlife to raise funds for my hedgehog hospital. You can visit my online jewellery shop here. Please join me in wishing Legolas a safe return to the wild. Excellent account as always! Great success stories thanks to your hard work Emma. Best wishes for Legolas’s safe return. Thank you for all the work you do caring for injured or sick hedgehogs and rehabilitating and releasing them when possible. Also for raising awareness of the needs of these creatures that are having to adapt to radical changes to their environment.